The best part of being a REACH Scholar would be having the opportunity to meet new people from all over the state of Georgia and participating in informational training and workshops. But most of all, it’s knowing that I will have financial assistance to attend college. I have benefited from my involvement in REACH by understanding that I can accomplish all my educational and professional goals because I now have the financial help I will need to make my dreams become a reality. I have obtained leadership skills by participating in training programs offered through REACH and I have formed friendships and relationships with students from all over Georgia. 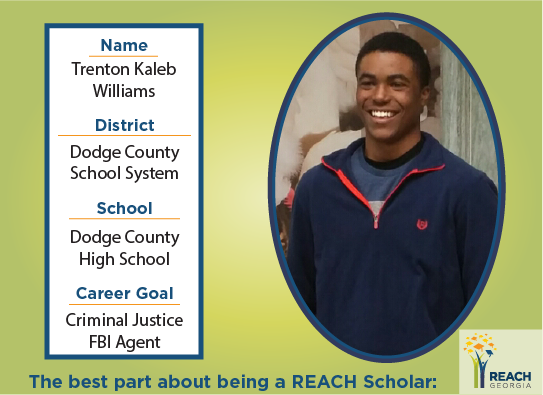 There was a time that I wasn’t sure if I would be able to attend college because of the financial cost, but now I am hopeful and excited about the opportunity I have been afforded by receiving the REACH Scholarship. I have set goals for myself and now I have faith and determination to accomplish those goals. I have the resources available to me to make sure I am successful in the near future.